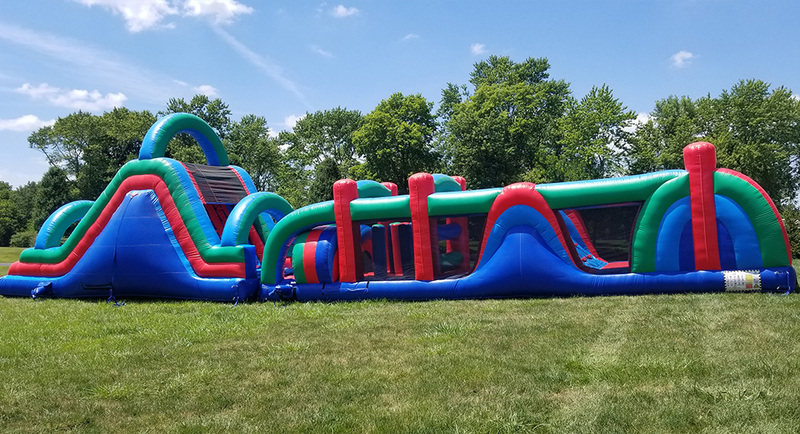 60′ Titan Rainbow Obstacle Course is sure to be a great addition at every events and family backyard party with its rainbow theme to make eye catching. Open air design structure to allow comfortable space and provides tons of fun along its path to bring joy to every kids. Rainbow archway welcomes racers into its wonderland to explore more fun, maneuvering around horizontal and vertical pop-ups, and obstacles. Challenging riders to push through a wall of inflated columns and crawl-through tunnels to race up the climbing wall and slide down to finish game. Whoever reaches the destination first is the winner. Above overhead netting is designed to prevent riders jumping from the top to ensure kids safety. 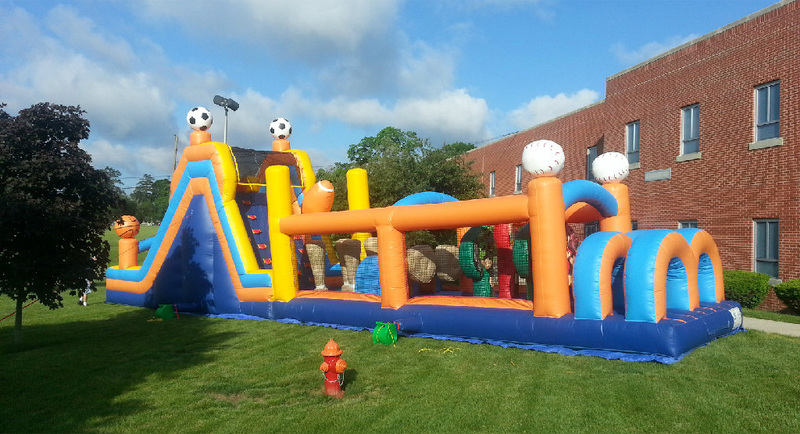 This 60 foot long titan obstacle course is great for private use or rental operators. Requirements: Inflatable requires a relatively flat surface about 17ft x 65ft within 100 feet of an electrical outlet. We prefer to set the inflatables up on grass, but concrete or asphalt is acceptable as well. All of our inflatables can be setup indoors upon request, and space requirements can be met. This Obstacle Course is sure to be a real thrill seekers delight with countless obstacles and popups as well as a tall climb and slide to finish off. Racers start off at the double crawl through, and make their way through several obstacles. As riders pass through these obstacles, they will then encounter the climbing wall, and tall slide. This 68' long Obstacle Course is a giant obstacle course that is sure to be a hit for any company or event it’s at. Requirements: Inflatable requires a relatively flat surface about 17ft x 68ft within 100 feet of an electrical outlet. We prefer to set the inflatables up on grass, but concrete or asphalt is acceptable as well. All of our inflatables can be setup indoors upon request, and space requirements can be met. This Obstacle Course is sure to be a real thrill seekers delight with countless obstacles and popups as well as a tall climb and slide to finish off. Racers start off at the double crawl through, and make their way through several obstacles. As riders pass through these obstacles, they will then encounter the climbing wall, and tall slide. 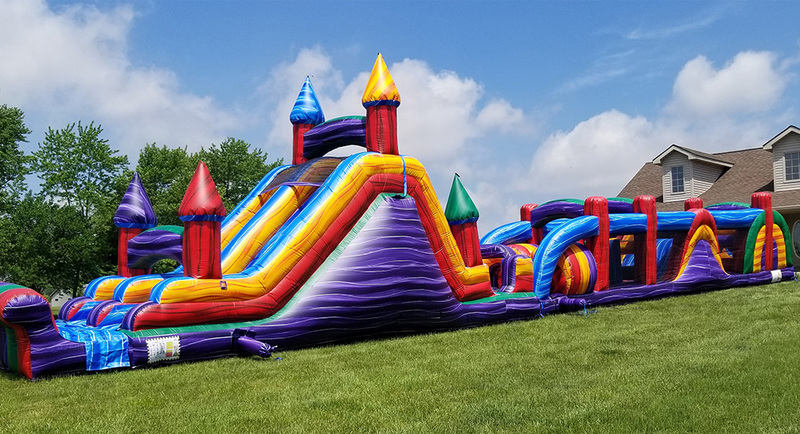 This 80' long Obstacle Course is a giant obstacle course that is sure to be a hit for any company or event it’s at. Requirements: Inflatable requires a relatively flat surface about 17ft x 85ft within 100 feet of an electrical outlet. We prefer to set the inflatables up on grass, but concrete or asphalt is acceptable as well. All of our inflatables can be setup indoors upon request, and space requirements can be met. 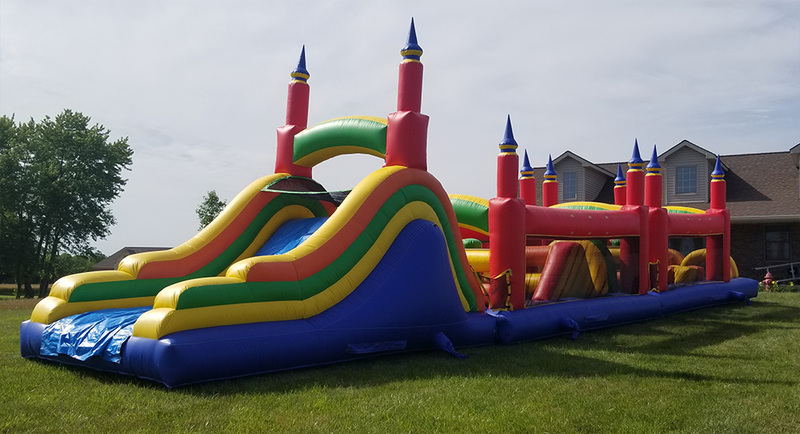 This unit is designed for 2 racers to run through this dual lane inflatable obstacle course together. The inflatable includes crawling areas and areas to weave through. 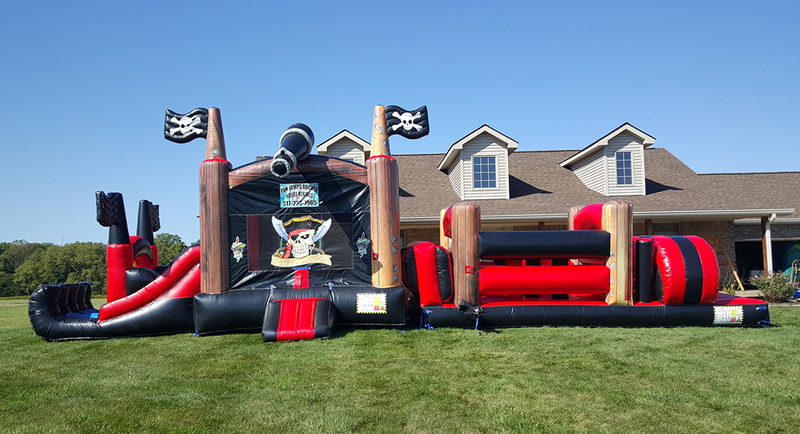 The obstacle portion ends in the pirate combo where you will find a jump area, basketball hoop, and a dual lane slide. This unit is sure to be a hit at any party. Requirements: Inflatable requires a relatively flat surface about 18ft x 60ft within 100 feet of an electrical outlet. We prefer to set the inflatables up on grass, but concrete or asphalt is acceptable as well. All of our inflatables can be setup indoors upon request, and space requirements can be met. This Sports Course is sure to be a real thrill seekers delight with countless sports themed obstacles and popups as well as a tall climb and slide to finish off. Racers start off at the double crawl through, as they enter the obstacle course they encounter 2 linebackers waiting to take their charge. As riders pass through these linebackers they then encounter a pair baseball gloves ready to catch them as they bounce through. Once past the baseball gloves there are more crawls through and then a host of baseball bat popups that riders have to find their way through. Past the popups is an 11 feet tall climb and dual slide to finish off. This 64' long Sports Course is a giant obstacle course that is sure to be a hit for any company or event it’s at. Requirements: Inflatable requires a relatively flat surface about 16ft x 64ft within 100 feet of an electrical outlet. We prefer to set the inflatables up on grass, but concrete or asphalt is acceptable as well. All of our inflatables can be setup indoors upon request, and space requirements can be met.